Entrance to Sikh Temple, Amritsar. 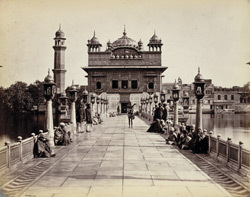 bl.uk > Online Gallery Home	> Online exhibitions	> Asia, Pacific and Africa Collections	> Entrance to Sikh Temple, Amritsar. This temple, built by Guru Arjan Dev in the late sixteenth century represents the spiritual centre of the Sikh faith and draws devout pilgrims from all over the world. Here they experience darshan, an auspicious vision of the temple deity, receive religious teachings of the original holy book, the Adi Granth and bathe in the purifying water. The tank has been known as the Amrit Sarovar or Pool of Nectar since the time of Ram Das, the fourth Sikh Guru.